One Nation. One Team. 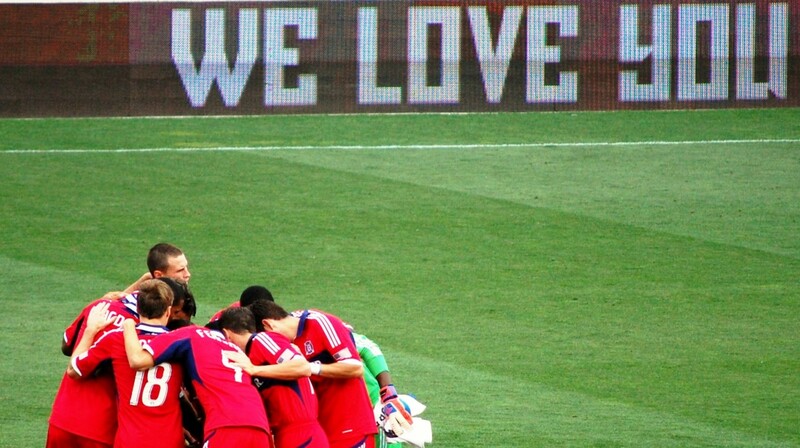 has been the marketing slogan for the United States Soccer Federation since the last World Cup cycle. Produced on official press releases and within stadium signage, the USSF is urging the faithful in Stars and Stripes to rally behind the men and women of the national teams (all while the Mexican national team often plays “home” games in the United States, to much larger crowds. One Nation, Two Teams?). With the release of the much anticipated, highly disappointing 2016 kits, the Federation has decided to forgo their own creed, touting uniqueness and solidarity, in favor of allowing Nike to dress them like the rest of the world. Since the release of the new badge in late February, many have speculated as to the appearance of the new identity of the national soccer program in the United States. Will the Federation finally stick to an identity? Will the nod to the Centennial kit in the new badge translate to the new kit as well? Unfortunately, for those that care about such things, the answers were a resounding NO. It’s fair to say the disappointment started on Leap Day, the date the new badge was unleashed on the world. Gone is the quintessential 1990’s flying soccer ball badge and in its place now sits a perfect badge for USA Track & Field or the U.S. Ski Team or USA Hockey. Pretty much a generic badge for any olympic sport, certainly nothing that should represent the United States team in the global game on a global stage. Though an upgrade from the previous, this new badge still feels like an opportunity missed. The United States is chock-full of patriotic imagery, recognizable throughout the world as uniquely American. Inclusion of a simple bald eagle or a snake similar to that of the Gadsden Flag would do wonders for the identity of US soccer or changing the lettering from “USA” to “USSF” to represent the Federation aligns with most of the world’s soccer badges and eliminates that generic Old Navy patriotic emblem feel. Above all else, what irks this writer the most is the fact this new badge swung and missed at the first basic rule of logo design for sports: the badge is not at all timeless. With its simple lines and lack of character, the badge plays well in 2016, but come 10 years from now, the badge will still look like 2016. The biggest pet-peeve among the supporters of U.S. soccer was the fact the previous badge looked like the 90’s. Unfortunately, the USSF has decided to make the same mistake and calls for an update to the dated badge will certainly come in 10-20 years. Just as soon as hope was dashed for a superior badge, anticipation for the kit onto which it would be adorned took off with full fervor. Leaks began to trickle out and we were all left to stare aghast at something which represented Nike more than the United States of America. Putting the U.S. soccer teams in black is outright appalling. Starting with the ladies’ black and volt (a color invented by the Nike marketing machine) garb in the Women’s World Cup, transitioning to this monstrosity, it is evident Nike is driving the USSF and supporters be damned. So much for “Supporters not Customers”. Sadly, I believe I could live with the occasional black secondary experiment if we would just stick with a traditional identity for the primary kit. Go with all white and a collar, go with a sash, hell, even go with Waldo, but stick with an identity and make slight variations every few years. Before any dissent had a chance to reach full throat, the home kit was leaked and left everyone scratching their collective heads. Why would you darken the blue on the crest, only to lighten it on the kit? Though attempting to answer the questions which arise from decisions made by Sunil Gulati’s mafia is a futile exercise, the explanation for this particular question seemed to present itself as the Nike-sponsored Euro participants began to release their kits for the upcoming tournament. Lo and behold, many look remarkably similar to this U.S. home kit. The USSF not only failed its supporters by creating a variation of any of the plethora of popular kits from previous years, they decided to show off the new badge and take the Federation into a new era by utilizing a Nike template. The most disheartening aspect of the use of a template is the fact that Nike has the capabilities to deviate from such a mundane appearance. See: Croatia. Nike released a beautiful, traditional checkered kit for the Croats, clearly a federation that understands history and identity. Why the USSF didn’t utilize Nike’s abundance of overpaid designers to come up with something bold and uniquely American is beyond me. In the end, I suppose I should be thanking Nike and the USSF for being so woefully inept. Yet another dreadful kit release means I can spend my money on things I find more appealing. That gorgeous, traditional green Republic of Ireland kit Umbro put out would look fantastic hanging in my closet. I totally agree, something needs to be done to the crest to make it “American.” Almost every country uses some form of historic emblem (a cross, animal, bird, ANYTHING) to make you recognize the country or something to make you WANT to learn something about a country. Welp, I’m not buying this new kit.